Naturasil specializes in natural, homeopathic remedies for several common conditions such as scabies, acne, nail fungus, and muscle and joint pain to name a few. Naturasil's Scabies formula, takes a comprehensive approach to eradicating a scabies infestation and attacks the problem at all angles. This company has been in the homeopathic business since 2004 and currently holds an A+ rating from the Better Business Bureau. Naturasil offers several products to approach a scabies problem. You can find homeopathic soap, topical liquid and a sulfur based cream. You should also take care to clean your bed linens, clothes, and furniture that may currently house the scabies mites. The Naturasil Scabies products are designed to work together or be used separately. If purchased together in the Starter Pack, you'll find the most comprehensive approach to managing your scabies infestation. The company recommends adding 10 to 20 drops of the Naturasil for Scabies product into a warm bath to soak for 20 minutes. You should also cleanse with the special soap for best results. The topical cream is the final step to help relieve the itching and burning as well as encourage skin repair. The company recommends the use of the soap at least 2 times daily on the infected area. The topical cream is applied 2 to 3 times daily for best results. Naturasil says that results should begin within 4 to 10 days, but we found several customers who noticed an immediate difference after only one use. A number of other customers said that expensive prescription products didn't work for them, and when they tried Naturasil they were able to finally eliminate the problem. The active ingredients in all of the Naturasil Scabies products is Sulfur 6X HPUS. Additional inactive ingredients vary per the product used, but most contain a variety of natural oils to relieve and repair the skin. Naturasil's Scabies products are priced affordably and start at $9.95, but the best deal is available in the starter pack that contains all three products. Customers will also find a free shipping offer on orders of $50 or more. If you aren't completely satisfied with your purchase, Naturasil provides a generous 90 day return policy. They do ask the customer try the product for at least 30 days before returning for a full refund. Unlike many other scabies relief options, Naturasil attacks an infestation with a number of different products designed to quickly and effectively eliminate a mite infestation. The strong customer feedback, as well as the generous return policy, put Naturasil for Scabies at the top of our list. They earn our highest rating. 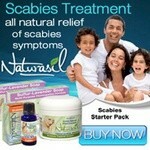 Scabies Control is an all-natural product designed to fight the presence of scabies and any related rash. Forces of Nature, the maker of Scabies Control, has been in the homeopathic product business since 1999 and all of their formulas are certified organic by the USDA and registered with the FDA. At this time, Forces of Nature are not accredited with the Better Business Bureau however, the FDA and USDA certifications are enough to guarantee their products will be free of any chemicals, pesticides or toxins. The active ingredients in Scabies Control are Silicea 6X and Calendula Officinalis 6X. The inactive ingredients are a combination of several organic oils to repair and heal the skin. The ingredients work to kill the mites as well as provide quick relief to the irritated skin. Per our discussion with Forces of Nature, the product will provide itch and rash relief within the first 24 hours but the actual elimination of the infestation will take some time. Alike any other product, customers must also take care to wash and clean bed linens, clothes and on frequently used furniture. To use Scabies Control the customers gently rubs the oil into their infected area up to 3 to 4 times per day. It's also recommended that 10 to 20 drops be placed in a warm bath for a 15 minute soaking. Unfortunately we weren't able to find any customer reviews of Scabies Control. However, the company offers a generous 1 year return policy for a full refund minus any shipping. Free shipping is available for purchase over $75.00. This allows customers to try Scabies Control at no risk. Scabies Control is a sulfur free product designed to immediately relieve the symptoms of a scabies infestation. The elimination of the actual mite will take much longer but can be eradicated. The attractiveness of Scabies Control is both the extended return policy and affordable pricing. However, customers will need to continue to use the product for some time to make sure the infestation is gone.